For many years (16 in particular), Return of the Jedi was considered the weakest of the Star Wars films. Then, in 1999, along came The Phantom Menace to displace it in the minds of many. Left unrealized as the prequels began their theatrical tour is that the “background trilogy”, once it was available in full, would not only to diminish George Lucas’ standing in fan circles but would damage Return of the Jedi’s already fragile reputation. For a film tasked with bringing the original Star Wars trilogy to a rousing conclusion, Return of the Jedi managed to be more long-winded than epic, more repetitive than original. Little of the thematic depth introduced in The Empire Strikes Back remained. The film does the job of providing the Rebel Alliance with a grand victory but accomplishes this in a way destined to leave demanding viewers unsatisfied. I’m sure behind-the-scenes wrangling was in part responsible for Return of the Jedi’s weaknesses. (There are all sorts of stories about backstage discord at Lucasfilm between 1981 and 1983.) George Lucas, who took a step into the shadows for Empire, returned forcefully to a controlling position. He and director Richard Marquand clashed, which led to the dismissal of the latter before filming was completed. Gary Kurtz, producer of A New Hope and Empire, was relieved of his duties after Episode V. Lucas and screenwriter Lawrence Kasdan didn’t see eye-to-eye on the script. Kasdan wanted to pursue the dark vein explored by Empire; Lucas wanted a more upbeat, heroic conclusion. The result: no truly “good” character perishes (unless you consider 900-year old Yoda, who dies of old age and becomes a force ghost). The fatalities are all villains: Darth Vader (David Prowse), Emperor Palpatine (Ian McDiarmid), Jabba the Hutt, and Boba Fett. Luke (Mark Hamill), Han (Harrison Ford), Leia (Carrie Fisher), and Lando (Billy Dee Williams) all live to fight another day. Lando’s survival is especially odd since there’s foreshadowing that the Millenium Falcon is bound for the big roost in the sky. 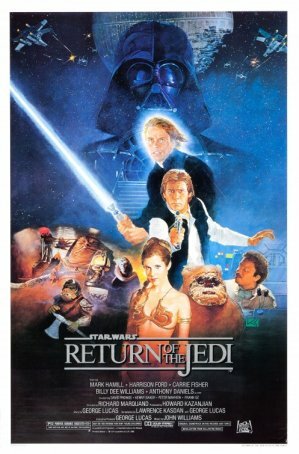 Return of the Jedi picks up an unspecified time after the conclusion of The Empire Strikes Back. Luke, Leia, Lando, Chewbacca (Peter Mayhew), and the droids (Anthony Daniels and Kenny Baker) are on a rescue mission to Tatooine. Their aim: to save carbonite-frozen Han from the clutches of the slug-like gangster, Jabba the Hutt. Once Leia has spent time in her slave bikini (launching a cosplay fashion line), Luke has done a little Jedi stuff, Han is restored and Jabba is dead, it's back to outer space, where the Rebel Alliance is about to face the Empire's newest (old) threat: a second, more powerful Death Star, that, if activated, could spell doom for anyone who stands against the Emperor. (Kind of like the first Death Star, and we know how that went…) So, while the fleet prepares for the final battle, Luke and company travel to the forest moon of Endor to knock out the shield that defends the Death Star against all attacks. There, they are befriended by the Ewoks, the teddy bear-like indigenous race, and Luke, fearing that his presence is endangering the group, turns himself over to Vader, who has been given the task of bringing the newest Jedi in front of the Emperor. Return of the Jedi is in large part a rehash of A New Hope. The existence of a second Death Star in the Star Wars universe is problematic since it was never referenced in either of the previous films. It came into being because George Lucas couldn’t figure out a way to end the trilogy without a Death Star fight. The attack and subsequent space battle are an order of magnitude more spectacular in Return of the Jedi than in A New Hope, but it’s impossible to shake the “been there/done that” feeling. And, although the special effects are top-notch, the engagement includes some bizarre moments, such as the offhand manner in which the super stardestroyer is dispatched. Another “wrong note” moment is the revelation that Leia is Luke’s sister. Lucas apparently did this for two reasons: (1) it had always been his intention to introduce another Skywalker - this allowed him to do it without adding another character, and (2) it resolved the Luke/Han/Leia triangle without having everyone’s favorite Jedi losing out romantically. Of course, this adds an “ick” factor to the scenes in A New Hope and The Empire Strikes Back when Luke and Leia kiss. Bloat infects Return of the Jedi. It’s apparent in the Jabba the Hutt/Tatooine sequences that open the film (and seem to go on forever) and is even more egregious on the forest moon of Endor. My biggest complaint about the Ewoks isn’t that they were created primarily for merchandising but that their scenes are boring. They encourage fast-forwarding. There’s a lot of dead space in this film and most of it is filled with Ewoks. If there’s an area of agreement about Return of the Jedi, it’s that the Luke/Vader/Emperor scenes are the best the movie has to offer. They are tense and there’s a sense of uncertainty about how things will be resolved. Nevertheless, these segments lose some of their power when seen after Revenge of the Sith. Palpatine, as presented in the prequel trilogy, is the ultimate planner: a sly, intelligent, ruthless manipulator of others. The methods he uses to recruit Anakin are masterful. His approach with Luke is considerably less impressive. He sits on this throne, cackles, and taunts. His enticements aren’t compelling. He also appears oddly blind to Vader’s wavering. One thing that disappointed me during my initial viewing of Return of the Jedi is that Vader, the inscrutable icon of evil in A New Hope and The Empire Strikes Back, has been softened. I understand the reasons for this - Vader’s nastiness needs to be scaled back not only to make the Emperor the bigger threat but to make the re-emergence of Anakin more credible - but the character’s transformation from primary villain to henchman is disappointing on a fundamental level. This is one area where the existence of the prequels works in Return of the Jedi’s favor. Luke’s insistence that there is “still good” in Anakin is a more compelling argument once one understands the character’s fall. Although there were arguably more changes to the Special Edition of A New Hope than Return of the Jedi, Lucas’ alterations to Episode VI generated a stronger reaction. Most of the enhancements were viewed positively - the reworking of the Ewoks’ song and the celebratory glimpses of other planets at the end - but one update has become the focal point of criticism. Although I understand the reasoning behind adding a “Nooooo!” to Vader’s final actions, it was not a well advised choice. The objective is to establish a parallel with the end of Revenge of the Sith but, in doing so, Lucas ignores the effectiveness of the editor’s work (the way the camera alternates between Vader, the attacking Emperor, and the writhing Luke). Vader’s outburst isn’t needed; in fact, it’s distracting, especially for those who have watched the scene for years in its original composition. The best thing that can be said about Return of the Jedi is that it concludes the saga. Another Death Star is destroyed, the two Sith Lords are killed, the Empire is in shambles, and the Rebel Alliance has won the day. The only note of sadness comes from the loss of Anakin but his acceptance by the good side of the Force moderates the blow. Happy endings are fine but the weakness and predictability of Return of the Jedi’s narrative remains a disappointing way to conclude an epic with such strong first and second chapters. There are many who condemn the prequels as unworthy of “classic” Star Wars but a case can be made that Return of the Jedi is the worst installment of the entire Lucas-helmed series.